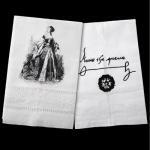 This lovely tea towel from Tiffini Elektra (Tartx) features a design based on a vintage engraving of Anne Boleyn along with her signature and the Tudor Rose. 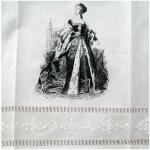 This is an absolutely lovely delicate towel that is a "decorative" linen towel. 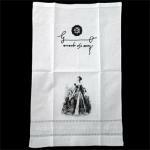 For more of a good all purpose towel see our flour sack towel as that is a great heavy duty kitchen towel. 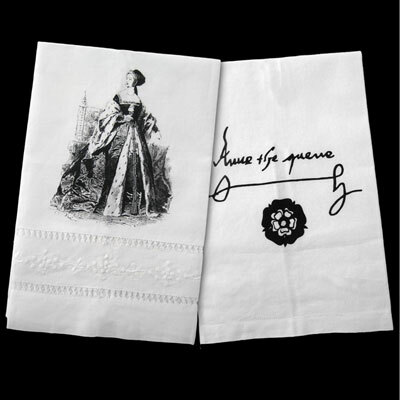 Superb quality, 100% linen decorative tea towels. 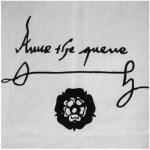 Hemmed on all four sides with a dual hemstitched border at the top which is decorated with an embroidered floral vine design. Damask Tag looped for hanging. Dimensions: measures approx. 14" x 22". Machine wash cold, line dry and iron when needed.